No, the real hell is the world that so many of those we pass on the streets live in as we worship, as we protest, and as we debate what to include or not include in a book so few in our world read or care about. With arms full of three-dozen Voodoo donuts, we took a break from the conference and hit the streets of Portland, praying for the Holy Spirit to lead us. The number of folks living on the streets here is overwhelming. I have been to many major cities around the world and have never witnessed anything like it. We couldn’t walk a single block without finding someone excited to accept a doughnut and a smile from two goofy-looking strangers. We exchanged names with each person we met, and asked only a few simple questions: How has your day been? What are you up today? Where are you from? From those questions, along with a doughnut, flowed beautiful, yet painful, stories of deep suffering, hurt, and regret. It was real. Like, really real… the kinds of real stuff that us church folks prefer to keep hidden from one another. One of the friends I met shared with me her celebration of being off of Crystal Meth for two weeks. She wanted me to know that she still smoked weed, and she wanted to confess to me that she had been married multiple times… but she had survived two weeks without Meth! I could see the sense of accomplishment in her eyes as I told her how proud I was of her. She asked for a hug, and before we left she enthusiastically accepted a #GC4JC card made by child and a meal ticket to Sisters of the Road Cafe. I’ll never forget that smile or that hug. We met another woman who invited us in. The dirt covering her skin hid any chance at an accurate guess of her age, but she seemed young. We stood by her house made of old luggage and torn blankets and we listened as she explained that she had been dropped off on the streets when she was 14 years old and told by her parents that all she would ever be was a drug addict. She paused and then looked down and confessed that, in fact, that was all she had become. Glancing at the dog laying at her feet, she told us that that dog was the only one that had ever really loved her unconditionally. We gently reminded her that there was another. She told us about her 7 year-old little girl, who had a name similar to my own daughter’s name. Her daughter had been with her on the streets before someone finally called the police and she was taken from her. As this woman talked, I began to see clearly her drugs weighing on her like chains that she did not have the power to break out of. I could feel her heartbreak and her shame. I wish I could share each story that I was honored to receive. Each one was uniquely holy, though each also seemed to break my soul into smaller and smaller pieces. My day on the streets of Portland was a day filled with confession, with tears, with smiles, with hugs, and with many expressions of deep gratitude for someone, anyone, willing to stop and listen… and then love anyway. I learned more about Jesus’ love for me that day… probably because he was right there on the streets of Portland. Take a moment to look at this photo I took in the ancient city of Ephesus. It is of a 1st/2nd century AD public bathroom (click HERE to see the photo enlarged). It is believed that this public bathroom was open to everyone: women, men, and children. As you can tell, privacy was nonexistent and when fully occupied you couldn’t help but be pressed against the person beside you… and you REALLY didn’t want a corner seat! This is what the Apostle Paul and many of the early disciples would have used. In fact, there is a good chance that Paul could have used this exact bathroom. I can even confirm that to this day there are still bathrooms across the globe that share a single room with sinks for both men and women with stalls for anyone to use. I experienced first hand some of these bathrooms on my recent trip to Greece and Turkey. Thankfully, individual stalls gave each of us much more privacy than would have been afforded in Paul’s day. I only share this to point out that a large part of the current hot topic debate in North Carolina – specifically over gender specific bathroom usage – may be more of a cultural and temporal debate than a biblical and “Christian” one. I have no interest in using the bathroom while rubbing hips with my neighbor (whether male or female by anyone’s definition). I would be uncomfortable doing so. But I recognize that the Apostle Paul did, and that my own feelings have more to do with what I am used to and personally prefer than some universal code of bathroom morality. Again, I am not trying to debate one side of the issue or the other here (either side could simply take this information and say that the opposite side should care less about their understanding of the “right bathroom” because of it). I am only sharing historical information and pointing out that arguing for gender specific bathrooms from a biblical and “Christian” perspective (as many seem to be) may be at least slightly flawed. 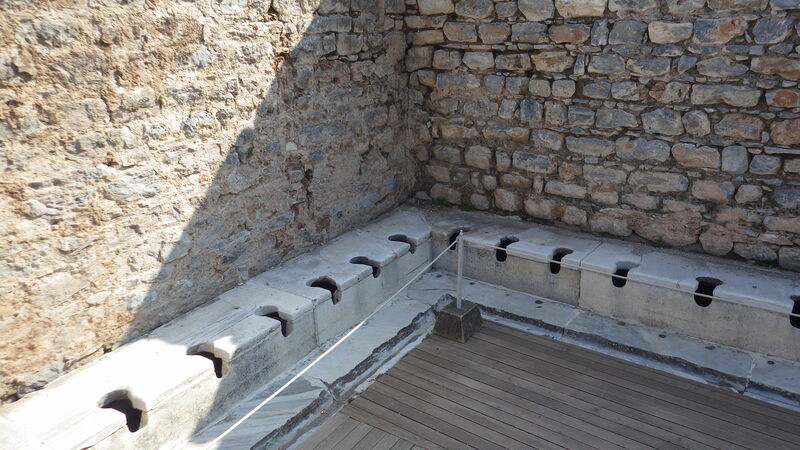 Looking back at the picture of the public bathroom in ancient Ephesus – of holes in stone, no barriers, seemingly way too close to your neighbor’s seat – I cannot help but wonder if getting everyone into his or her “right bathroom” is actually as important as we feel like it is in this moment. After seeing the norm for Paul (and that corner seat! ), I am just thankful for a private throne, a door, and, of course, some toilet paper. I have witnessed something beautiful in the midst of the countless personal conversations, posts, articles, and memes in regard to Syrian refugees. For a while now it seems almost every public “issue” that has come up has caused a politically liberal / politically conservative divide. I share Facebook and life with Christian friends of both persuasions, and this refugee issue is the first in a while where Christians of all political perspectives seem to be shouting out together, in unison, in love and concern for Syrian refugees. Now let me be clear, by “Christian” I mean those who actively follow Christ, in part by being actively involved in a community of faith, devoted to prayer, scripture reading (having actually read the Bible in faith), and committed to works of mercy in Christ’s name. I do realize that there are those who call themselves “Christians” who desire to block refugees, but the truth is that even apart from this issue most of those folks have long been living lives tied more to their political views than to any authentic Christian community. If anything, this issue has made clearer the line between the Church in America and the American “church,” and that is a beautiful sign of hope for the true Church’s future in this country. I realize that I have not offered a theological case for opening our borders and our homes to Syrian refugees. It isn’t necessary. God’s kingdom isn’t revealed to those outside the Church by means of a witty demonstration of Christian logic (though we sure do try hard, don’t we?). The Apostle Paul makes clear that all either live by the Spirit or by the flesh. It is the Spirit that allows us to live and love like Christ without fear of even our own future (we know who holds our future!). Theological ramblings have little power for those living fully in the flesh, though I am certain that God’s grace continues to reach out to seek to draw even the “fleshliest” among us into a new way of living and loving that truly can cast out all fear. All that to say… I am hopeful, friends. I believe that as we continue to look to Jesus instead of the agenda of the political side of our leaning, God’s Spirit will continue to unite us as One, moving us together towards that day when all will see that in Christ there is no longer Jew or Gentile, Slave or Free, Male and Female, Republican or Democrat, American or Syrian. This past week I took my dog to the vet for the first time. It was a traumatic event for both me and for my dog. We were doing fine until it came time for her vaccines. She was taken to another room and surrounded by people she did not know who held her down while attempting to jab her with multiple needles. She flipped out, and I saw a side of her I had never seen. Our always kind, loving pet (the one that our kids jump on and wrestle with daily) turned aggressive and bit the hand of one of the veterinary assistants. Unfortunately, the vet’s office is not the only place I saw “biting back” this week. Now let me be clear, I am not about to get into the history of the confederate flag or to discuss the debate of heritage or hate. The truth is that my degrees are in theology and I simply don’t know enough about those things to speak to them. Anyway, plenty has already been written about all of that, and I suspect it is easy enough for you to search for and find whatever narration of history you prefer. Instead, lets talk about the biting back. While I don’t know much about the confederate flag, I do know four things with complete certainty: 1) Racism is still present today, 2) people are afraid and hurting because of it, therefore 3) it is something that God cares deeply about, and so 4) if God cares deeply about it then we should too. Now, I know there are some of you who are reading this and who are already growling and showing me your teeth. I know there are some of you who already want to talk about reverse-racism and ways in which you feel like you have been held back because of your pale skin color. I get it. I really do. You are tired of people analyzing and magnifying the possibility of racist intent. You don’t think it is fair that in order to try to end racism in this country we have to make policies and put in place rules that seem unbalanced and can favor minorities. You feel some of your power slipping away each and every day. I get it. But here is the thing… our Christian Story reminds us that the world is made new through sacrifice and that following Jesus into a new and better world often means lowering ourselves, as Christ did, that we might lift others up. Yes, you have been inconvenienced by others people’s desire to do all they can to destroy racism, but that is not the same as living in fear, being unable to do things that others take for granted. It is not the same thing as only being able to travel on major highways throughout the South because you are too afraid to stop for gas at rural gas stations simply because of the color of your skin. Somehow we have forgotten that there is a cost to following Jesus. That if we are to be a disciple of Jesus then there is a lot we must give up – yes, even things we like. We have been renewed to live for Christ, and can no longer live simply for ourselves. This means that we have been called to give up our own history, our own present, and even our own future in order to allow God to help make us, and our world, better for all people and all of creation. There will be no confederate flags in God’s Kingdom. I am certain of that. So what if you lived into your prayers for a world that would reflect God’s Kingdom by sacrificing a flag you love and, for the sake of a person in rural NC who doesn’t know where he can safely stop for gas, replace it with a symbol of peace that clearly says, “all people are welcome here.” Instead of holding so tightly to our own history, especially one that so clearly scares a significant population of people, what if we followed Jesus into a future that is open for all people. I know that it is hard not to bite back when you feel surrounded and threatened, but the hands we bite may be God’s own hands helping to cure our world from the diseases that are still a threat to us today. So if you are a confederate-flag-loving, white, non-racist Christian who knows that there is a cost to discipleship, I want to challenge you with a difficult task. Consider making a special offering to the Lord this Sunday. When the offering plate is passed around at your local church, consider giving more than just your money. Bring with you that flag you love, and as an offering of peace and reconciliation and love for all God’s people, I challenge you to place it in the plate. Trade it in for a hope in a future where no one will have to live life in fear, where we can all live together on earth, just as it is in heaven. I am deeply saddened by this article in today’s Lincoln Times-News. The quotes are almost unbearable to read. Nothing about this article is “Christian” or speaks to Christianity… only to some sort of false god that I have no interest in being associated with. This is the yet another example of a person more interested in defending his version of a Jesus (or more accurately, defending his own way of life) than seeking to follow the risen Christ in both word and action. His message distorts the Gospel as self-serving and uncaring towards outsiders. Both could be no further from the truth. We were once foreigners… we were once slaves… we were once gentiles… we were once outsiders to the faith… and yet, thanks be to God, it is God’s patient love that didn’t defend and protect God’s-self, but our God emptied himself to come down to meet the lost right where we were. I am eternally thankful that God never stops seeking and drawing those on the outside in, even when it is easier to push away. Christian brothers and sisters – we cannot try to keep “our way of life” by hijacking the name “Jesus” to defend a false gospel. Making the world around us appear more “christian” never gets to the heart of the matter and only makes for harder hearts in us and in others. God’s Kingdom came and continues to come through self-sacrificial love for the lost and the least in this world. We cannot be a better Christian than Jesus.